Installation of SuperQuilt for under joist flat roof applications and additional insulation products should be in accordance with the manufacturers certificate, fixing instructions and current good building practice. SuperQuilt should be overlapped at each joint by approx. 50mm and stapled onto the joists, the joints should be sealed using YBS Foil Tape. When SuperQuilt is cut to fit around openings or connections, gaps must be minimized and any exposed cut edges should be sealed with YBS Foil Tape to prevent condensation. SuperQuilt should be cut equal to the width of the roof section plus 100mm. 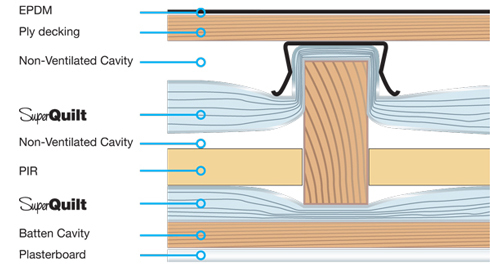 Installation should start from the external wall with SuperQuilt being unrolled perpendicular to the joists, after which it is fixed using staples, nails or YBS saddle clips. 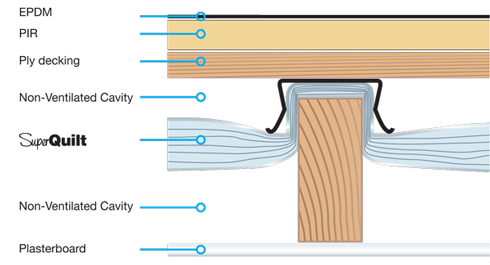 SuperQuilt should be held in place using timber battens or by other means as shown, in such a way that there is a nominal 25mm air cavity above the product (if applicable) and a nominal 25mm air cavity below. 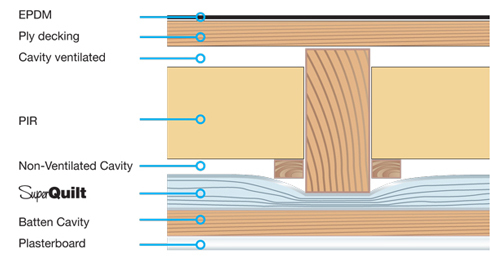 To minimize the effect of thermal bridging cross battening is advised. 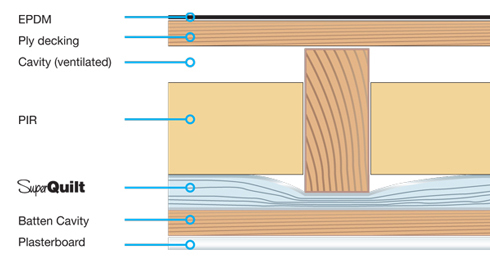 When installed below joists SuperQuilt will perform as a vapour barrier. Installation of SuperQuilt for over joist flat roof applications and additional insulation products should be in accordance with the manufacturers certificate, fixing instructions and current good building practice. SuperQuilt should be cut equal to the width if the roof section plus 100mm. Installation should start from the external wall with SuperQuilt being unrolled perpendicular to the rafters, after which it is fixed using staples or nails or with saddle clips. Additional insulation should be installed above the SuperQuilt. Installation of SuperQuilt for over and under rafter flat roof applications with additional insulation should be in accordance with the manufacturers certificate, fixing instructions and current good building practice. SuperQuilt should be overlapped at each joint by approx. 50mm and stapled onto the rafters, the joints should be sealed using YBS Foil Tape. When SuperQuilt is cut to fit around openings or connections, gaps must be minimized and any exposed cut edges should be sealed with YBS Foil Tape to prevent condensation.